When you get dressed in the morning, do you notice these long, rippled, streaky lines that seem to crowd around specific areas on your body? They could resemble scars from how they look over your skin, yet they’re indented and seemingly happen overnight. These streaky lines are known as Striae gravidarum, or the more common term for them would be stretch marks. They can look unsightly and discolored, but they’re a natural occurrence that everyone experiences at some point in their lives or another. While they can be unappealing, they don’t have to be permanent. In fact, there are several ways to get rid of them and return your skin to looking smooth and soft. We’ll go over generalized information regarding stretch marks and some of the best methods of getting rid of them once and for all. It’s always best to determine what these ugly lines are before tackling the problem of getting rid of them. Stretch marks are the result of your body overgrowing for any reason, and your skin is unable to keep up. Children can get them when they hit a sudden growth spurt, and women commonly get them when they hit puberty or undergo pregnancy. Even after all that, you’re also more likely to develop stretch marks if they run in your family. It should also be noted that if you’re a woman, your chance of getting them is also pretty high. Why does this happen? What causes stretch marks to stretch and tear like that? Stretch marks are a disturbance in our skins elastic fiber, so when we grow, and our skin can’t keep up, our skin begins to tear on a molecular level. The skin is more stretchable thanks to a hormone known as collagen, which is responsible for keeping your body malleable, so you can have free range of motion without breaking your skin whenever you move. Stretch marks aren’t harmful, but they’re never appealing and can cause those who have them to become insecure about their appearance. Luckily for us, even if your newly formed stretch marks come with a deep red or purple color, most of the time your stretch marks will fade to your natural skin tone with time. It just needs a little bit of time to recover from its sudden need to stretch. The exciting thing is that not everyone will get stretch marks in the same places, most of it is dependent on your lifestyle habits and genetics; however, there are more common areas that stretch marks can appear. 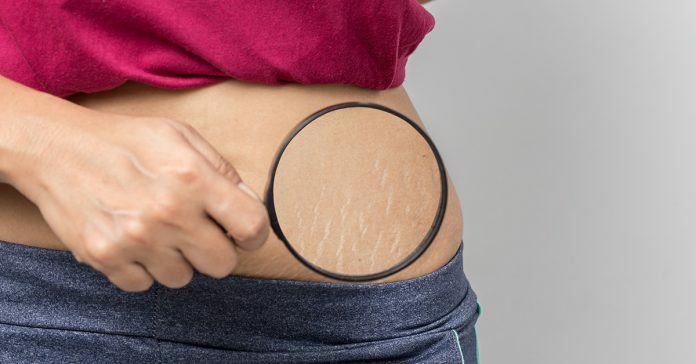 These are more common places for people to get stretch marks, but honestly anywhere that the skin stretches quickly are subject to them. Stretch marks don’t have to be a permanent situation but understand that stretch marks are a very regular part of the human body. As such, any sudden weight gain or growth of any kind will result in more. Now with that out of the way, let’s take a look at some of the more popular ways to get rid of stretch marks. Starting with a prevention program will help keep new stretch marks at bay. Dermatologists typically recommend starting with staying well hydrated and maintaining a proper weight. Hydration is critical if your skin is often dry and flakey, having those conditions as a base will make it easier for the skin to tear and that’s the exact opposite of what we want to do. Maintaining a healthy weight should be relatively understandable if sudden growth directly results in new stretch marks. It’s also recommended to eat foods that are rich in Vitamin C, Vitamin D, Vitamin E, and Zinc to maintain healthy skin. While these solutions won’t remove the stretch marks you may already have, it doesn’t hurt to get into the habit for a more youthful skin to prevent new formations. This seems to be the more popular option with the general public. There are many creams on the market that vow to reduce the visibility and color of new and old stretch marks and they promise to do it fast. These stretch mark removal creams tend to be more expensive and leave many consumers greatly disappointed. Creams can be a useful tool if you know what to look for, ingredient-wise and oils are excellent home remedies that have helped some people reduce their stretch mark issue. Here’s a look at some ingredients to look for when you’re trying to find cream for stretch mark treatment. Creams that contain Tretinoin, or Retin-A, have been used to treat skin conditions such as wrinkles and stretch marks. The reason that this works is that tretinoin contains Retinoid, which is an active cell-building form of Vitamin A and can help reduce the visibility of newer stretch mark scars. The only set back that this has is that it may cause redness, irritation, or even skin scaling with more sensitive skin types. It’s recommended that you test it first on a small area of your skin before using products with tretinoin regularly. If you use anything that claims to boost your collagen levels, check if the ingredients carry StriVectin-SD or lupin seed extracts. These have been known to bolster collagen in your skin which helps keep your skin stretchable. These kinds of creams are perfect for preventing more stretch marks from showing up unexpectedly. This is an herbal oil that is known as a herbal cure-all is typically used on wounds to boosts cells that make collagen and help build up skin tissue. It has been found that using this oil on your skin, especially on stretch mark sites, will ease the visibility of these scars and help strengthen the skin. A study was published about the potential benefit of bitter almond oil on pregnant women looking to reduce the number of stretch marks they got during pregnancy. Only 20 percent of the women in the study developed stretch marks while using the bitter almond oil, and the rest seemed to have a drastic reduction to the number of new stretch marks during the rest of their pregnancy. These are ingredients found in most skin care products to help soften skin and “revive” it. Since coconut oil is praised for its ability to absorb instantly into the surface, it’s a popular choice for lotions and creams to keep your skin hydrated. As stretch marks tend to form more when skin is dry and dehydrated, these oils may be what you need to help minimize both the volume of new stretch marks and the appearance. Another more popular oil that’s found in skin care products, argan oil helps the skin stay elastic and robust which would help keep stretch marks at bay. Because its so easily accessible and research backs up claims of what this oil can do for your skin, it’s worth a try to keep your body stretch mark free. This is a method that some dermatologists use to help with stretch marks. This works by exfoliating top layers of skin off to help even out the skin around the stretch mark so it will blend in more seamlessly. Some have found that the sugar scrubs work well for this kind of treatment and found success in its use. You can find a good variety of body scrubs at any shop and there’s many tutorials online that can help you create your own homemade body scrub out of everyday items. Be sure to moisturize the affected area well after you’ve scrubbed thoroughly. This helps keep irritation to a minimum and hydrates the newly exposed layer of skin to prevent it from tearing later on. If the creams don’t feel like your style and you’d rather see a dermatologist, that’s an excellent option to take into consideration. 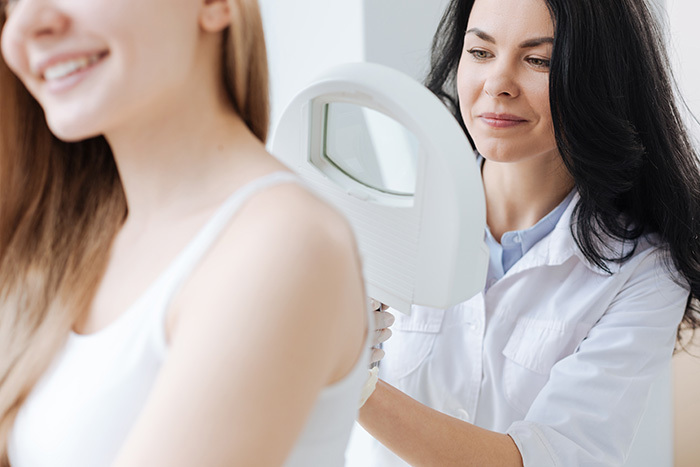 The only downside to seeing a dermatologist regularly for treatment is that it can get pricey, and because insurances typically don’t cover aesthetic procedures, you’ll likely pay out of pocket. Regardless, you’ll likely see better results sooner than you would with creams. The American Society for Dermatologic Surgery, or ADSD for short, highly recommend the use of laser therapy as the best way to significantly improve the look of stretch marks and pregnancy stretch marks. 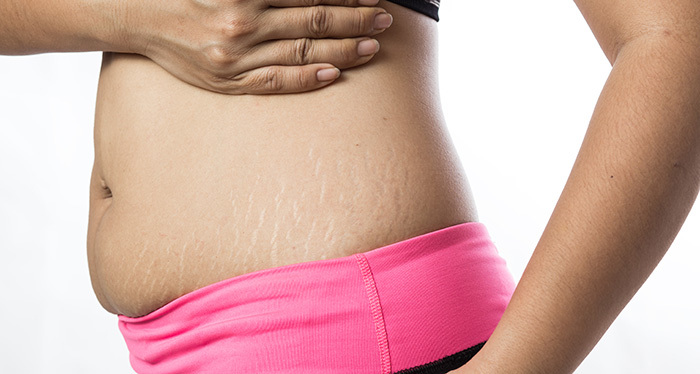 Most patients see a 20 to 60 percent improvement to their stretch marks; however, it can take up to 20 different sessions to get to that point. This one sounds a bit off, but there’s good science backing this one up. They’ll take plasma from your blood right before the procedure and uses it to help revive the skin and encourage collagen production. 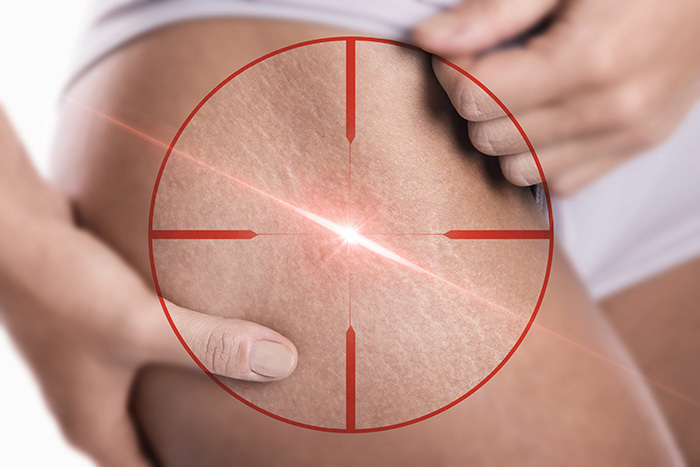 A study in the Journal of Cosmetic and Laser Therapy did a study where they proposed combining ultrasound therapy with this procedure can provide an excellent treatment option for reducing stretch mark visibility. This is a classic for anyone not happy with parts of their bodies. Plastic surgery can limit the view of stretch marks by merely taking that excess skin off. There are certain limitations on who can undergo plastic surgery and of course, it’s not foolproof. Unfortunately, like any surgery, there’s scarring and swelling in the areas affected by operation and recovery time is also something that should be considered before taking this option. Another way to fade out your old stretch mark scars, microneedling is a procedure that jumpstarts your collagen production. There’s no need for anesthesia, and there’s no downtime required to go through with it. What they do is use a thin needle over areas of the skin that are most affected, and they create small perforations over that area. What this does is kick start your body’s healing process and stimulates the collagen as a result. Your skin will also be more receptive to active ingredients in skin care products which can aid your stretch mark issue faster than average. This is a procedure that still has to go through several sessions to see the desired results, but once you’re at that point, you’re touch-up requirements are typically limited to once a year. What can help your stretch mark problem, is staying healthy first and foremost. Once you’ve achieved a healthy weight and you’re staying well hydrated, then see what will work best for your stretch marks. One of the best things about stretch marks is that they will fade over time, naturally, without any interference on your end. You just have to be patient. For those of us who would instead just get it done and over with, so they can have the smooth skin that they once had, there are options for you. What you choose to use is up to you, but at least we’ve been able to cut out most of the nonsense only to bring you the best products and procedures to get rid of those stretch marks and those insecurities. It’s finally time to wear that favorite pair of shorts again or show off your bikini bod without anything holding you back. You can look as fantastic as you’ve always wanted to be, wearing clothes that meet your styles without worrying about your stretch marks.